Acer yesterday celebrated Ferrari's Grand Prix World Championship victory with a bright red special edition notebook bearing the famous prancing pony logo and dubbed the Ferrari 3000. Acer is one of the Ferrari racing team's official suppliers. AMD is one of the team's sponsors - check out the tiny logo on the tail fin - and the Ferrari 3000 sports a "powerful AMD processor", though Acer didn't say which one. The notebook also packs in 512MB of DDR SDRAM, a 60GB hard drive and a DVD writer. The 15in screen is backed by an ATI Radeon Mobility 9200 chip. The Ferrari 3000 provides integrated 802.11g wireless networking adaptor, Bluetooth support, and 10/100Mbps Ethernet and 56Kbps modem fixed-line connections. There's a four-in-one memory card reader, USB and 1394 ports, and S-video output, too. Acer will ship the Ferrari 3000 next month for around $1999. last week launched a pair of consumer-oriented notebooks, the Satellite A15-S129 and the A25-S279, both targeted at the desktop replacement market. The first of the two is based an a 2.4GHz Intel Celeron desktop chip, backed by 256MB of memory and a 40GB hard drive. The 15in display is driven by the notebook's chipset. In addition to a DVD-ROM/CD-RW combo optical drive, the A15 sports the usual 56Kbps modem and 10/100Mbps Ethernet connections, a pair of USB 2.0 ports. The A15 can take an optional WLAN card, but the A25-S279 comes with an 802.11g adaptor built in. In addition to the I/O offered by the A15, the A25 has an extra USB 2.0 port and an SD card slot. Its 2.8GHz Pentium 4 sits alongside a 60GB hard drive and 512MB of RAM. 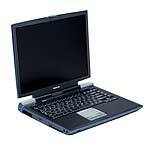 It too has a 15in screen and a DVD-ROM/CD-RW combo optical drive. Both notebooks ships with Windows XP Home Edition and Microsoft Works. The A15 costs $1049 in the US, the A25 $1549. Both are available now. Fujitsu has upgraded its LifeBook P5000 notebook by adding a 1GHz Intel Ultra-low Voltage Pentium M processor to the line for enhanced endurance. The company claims the machine offers an 11-hour battery life, but we note that that's with a second battery added. The P5000 ships with up to 512MB of 266MHz DDR SDRAM - it contains only a single SO-DIMM slot. Fujitsu offers a choice of 40GB or 60GB hard drive capacity. 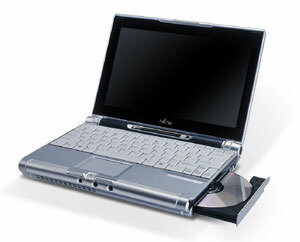 There's no optical drive per se, but users can buy a combo DVD-ROM/CD-RW drive that fits into the notebook's media bay. Alternatively, they can add the second battery we mentioned before, or leave the space empty to keep the notebook's weight down to 1.5kg (3.4lbs). The 10.6in screen is driven by the notebook's i855 chipset. As a Centrino machine, it also features an integrated 802.11b wireless adaptor. There's a 56Kbps modem and 10/100Mbps Ethernet for fixed-line connections, too. Fujitsu is also offering a variant machine, the P5000D, which integrates a non-Intel 802.11g card. Both notebooks include a Type I/II PC Card port, CompactFlash slot and two-in-one Memory Stick/SD card adaptor. They also sport two USB 2.0 ports, a four-pin 1394 port, and mini S-Video and VGA ports, both of which use bundled adaptor cables.